As you can probably tell, I'm member of the furry fandom and have been since 1997. 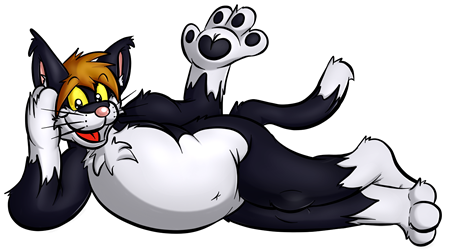 Online, I go under the pseudonym of SlyCat, a toony black and white cat. In the fandom, I regard myself a fursuiter as that's how I found the fandom all those years ago but while owning a fursuit, I don't wear it much outside conventions. These days, I regard furry a place where I can socialise with like minded individuals I have come to know over my time in the fandom. You can read more about me in my WikiFur page. With all the various social networking sites that are available now, there's little need for most to have a home page any more, however this site's been around since 1999 and these days this sites serves as a hub for all my various inputs to the internet. On the right, you can see my Twitter Feed. I also have a LiveJournal which I use for longer traditional blog entries (been going since 2001). Elsewhere on the internet, I have produced some pages for the fandom such as Furmeets UK where people can come and find out what meets are going on in the country and also add their own. I also made Fursuiters UK, however this site is in need of a overhaul, much like this site was. I'm also the registered "owner" of the #UK IRC channel on the FurNet network where I can be found most of the time when I'm online.